Multi-language calls are no longer limited to the Skype network. Skype snuck an interesting new feature into its preview build of the Skype Windows Store app late last week. The new version of Skype Preview can now perform real-time spoken word translations via Skype Translator when calling landlines and mobile phones—no Skype required on the receiving end. This is a huge deal, bringing Skype one step closer to becoming a true universal translator. To try out the new version of Skype Preview you’ll need to be running the latest version of the Windows 10 Insider preview build on the fast ring—Build 14986. Once you’re on that build of Windows 10, download and install the latest version of Skype Preview. If you already have Skype Preview installed just check the Windows Store for any updates. On top of that, the new feature requires some Skype credits or a calling subscription since calls to landlines and mobile phones are not free. If you’re an Office 365 Home or Personal subscriber you already get 60 minutes of free Skype calling minutes every month. Skype Preview for Windows 10 with real-time translations to phones. Why this matters: Prior to this experimental feature rollout, Skype Translator required both people to be using Microsoft’s messaging app. Now, Skype’s looking to remove that dependence by allowing at least one side of the conversation to be Skype-free. That will make Skype real-time translation much easier to use since users don’t need to figure out a special time when both people are on Skype. 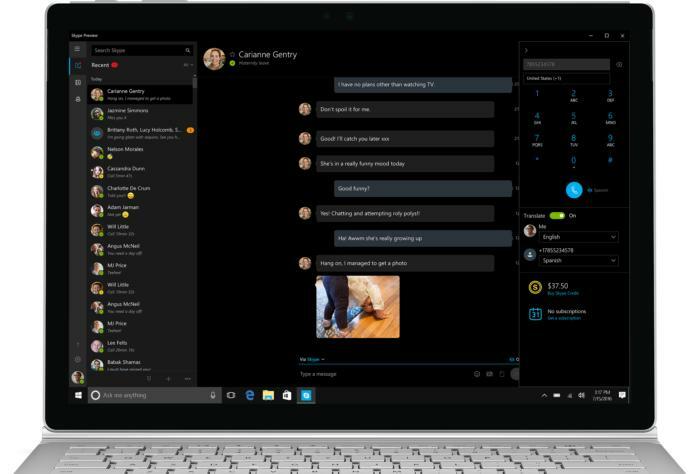 Instead, one side just makes a regular phone call from Skype on a Windows 10 PC. Skype translation to landlines and mobiles sounds like a great addition, but we haven’t tested it yet so we can’t say how well the new feature works. Keep in mind that this is still a preview feature so expect some hiccups. Using the new Skype feature appears fairly straightforward. Just input the phone number of the call recipient, specify which language each party is speaking, then hit the phone icon to connect the call. Skype currently supports nine spoken languages, including Arabic, Brazilian Portuguese, English, French, German, Italian, Mandarin, Spanish, Italian, and Russian.